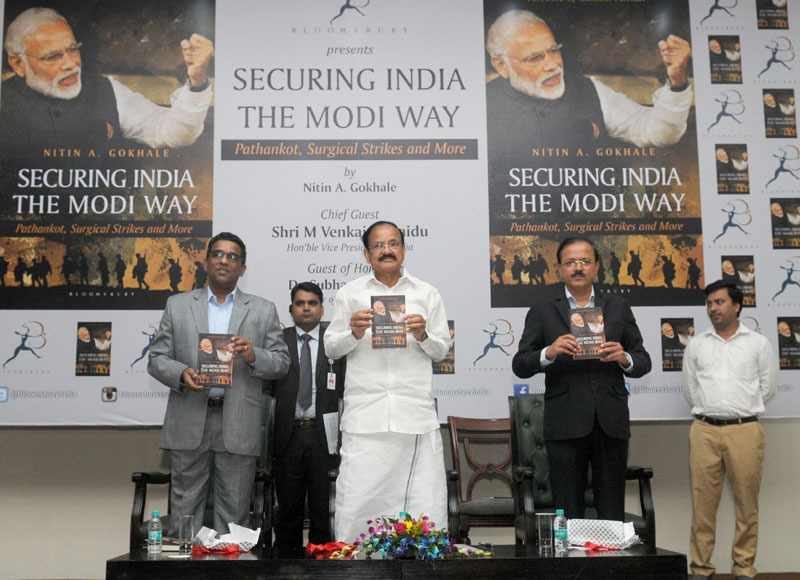 The Vice President, Shri M. Venkaiah Naidu releasing the book Securing India: The Modi Way, authored by Shri Nitin Gokhale, in New Delhi on September 29, 2017. The Minister of State for Defence, Dr. Subhash Ramrao Bhamre is also seen. New Delhi: The Vice President of India, Shri M. Venkaiah Naidu has said that Indian people have the right to know how decision-making happens at the highest level and what national security entails. He was addressing the gathering after releasing the book ‘Securing India: The Modi Way’ authored by Shri Nitin Gokhale, here today. The Minister of State for Defence, Dr. Subhash Ramrao Bhamre and other dignitaries were present on the occasion. The Vice President said that the book provides the most intimate and sweeping account yet of the NDA Government’s approach to national security and foreign policy initiatives. He further said that drawing on internal memos, as yet classified information, meeting notes and hundreds of hours of interviews with key players in the national security team, Shri Gokhale brings alive inside stories of decision-making at the highest levels in the government. The Vice President said that the book details hitherto unknown aspects of the planning and execution of the surgical strikes, revamping of New Delhi’s policy towards China and Pakistan, India’s renewed global policy focus on Middle East, Prime Minister Modi’s attempt to leverage the Indian diaspora worldwide, besides focusing on some small but far-reaching steps taken to secure India in every possible way – on land, space, cyber and maritime domains. The Vice President said that the issue of terrorism is at the fore front of government’s foreign policy world over. He further said that terrorism has no religion; it’s a threat to humanity and it should be curbed and we must be humane and sensitive in our approach while interacting with others. If there is tension there can’t be attention towards development, this should bear the basic principle, he added. The Vice President said that in democracy violence has no place and bullet cannot bring change where as ballot can. The policy of government should be zero tolerance towards terrorism and corruption both will eat away the vitals of our system, he added.